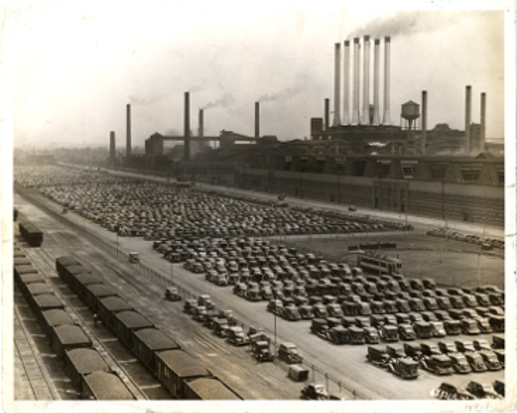 Last night, the Detroit Public Library [DPL] completed a mass digitization project pertaining to its Special Collections holdings, including over 33,000 images from its National Automotive History Collection [NAHC]. For those of us in the Gulf South, this is an incredible resource because it includes digital reproductions of early twentieth-century levees, roadways, cities, towns, automobile parades and "tin-can" camps. 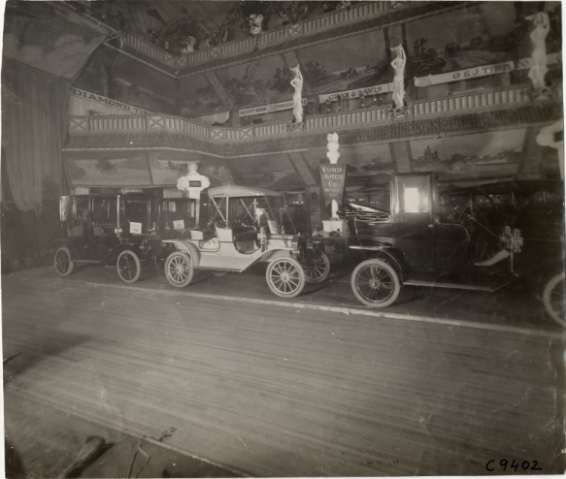 The digital collection is especially strong for Florida, where early automobile enthusiasts ventured in great numbers. Here is the link: On the home page type any search term you wish, like 'Ford' and see the photos. Great Resource. A few years ago there was an announcement in the NAHC newsletter that they were going to digitize the collection. I've been waiting ever since for it to finally become available. Just did a quick search and found a factory photo of a 1910 IHC roadster that I was not aware of. Thank's Dan,Added to favorites and i thought Kelly Springfield was a tire instead of a truck!!!!!!!!!!!!!! Bud. Thank you so much! 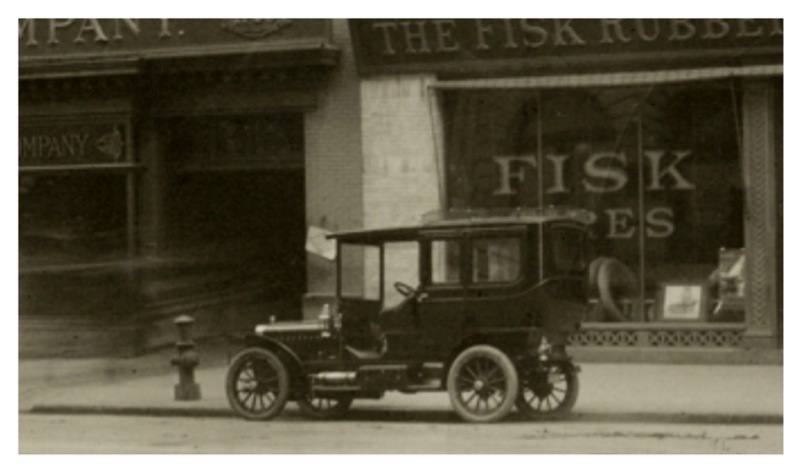 A search for Model T Ford only brought up 4 photos -- so I am probably doing something wrong. I think I searched only one collection. We will try again later. However, one of the photos http://digitalcollections.detroitpubliclibrary.org/islandora/object/islandora%3A 174631 Resource ID:na007459 is a rectangular shaped rear fuel tank 1911 Torpedo Roadster -- winter scene. That may have been posted before? I'm not sure if it is ok to repost their photos. I haven't read that much of their rules yet. The R or S (I am leaning towards Model R Runabout) is at: http://digitalcollections.detroitpubliclibrary.org/islandora/object/islandora%3A 174374 na007452 We will need to find out if they would like suggested corrections as they have it as a 1909 Model T Ford. Again, thank you for pointing it out. When you research photograph collections, you are at the mercy of the person who cataloged the photograph. Details and information provided can be arbitrary. You need to be general in your searches and then go through the pictures, no different than if you were sitting at the archives and physically thumbing through a folder of photos. There are probably many more photos that include Fords but are not identified as such. "Hupmobile" has 539 hits. Must be a lot more for Ford. Glad you guys are having fun with this site! In Aug I tried to get over to the Library and see the Special Collections in person. But didn't get the time as we were on the way to a cousin's wedding. Got this info today from my daughter's friend who is a researcher at Tulane University's Southeastern Architectural Archive. She had been to our house several years ago, and I gave her a Model T ride, and she also heard about my saga on the Wanderwell Around the World Expedition. So she sent my daughter this link and told me to look up "wanderwell" in the Nat Auto Collection. The complete Wanderwell photo collection is now on line! Wonderful for me! 450+ Photos from 1920 to the 1930's Many pictures of the tours and the many Model T's that were used, plus others that I haven't ever seen. I played some more with the search functions. Once you put your search term in the box and hit go, when the subsequent page appears click on the NAHC link on the right under "Narrow by Department" to narrow the search to the automotive collection. For "Ford," this narrows the results from 458 hits to 301. Erik. I used the link you provided above. 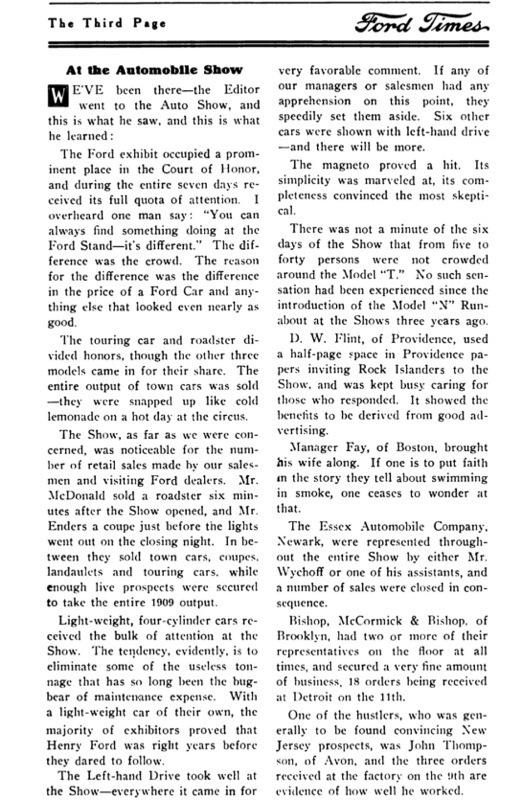 On page 3, there is a 1909 Town Car photo. It is a two lever, two pedal car, brand new in the showroom. I'm guessing it's been seen before. I don't know. I only got 42 "hits" for Ford model T" Found this under "ford"
Great site Dan, thank you for posting. 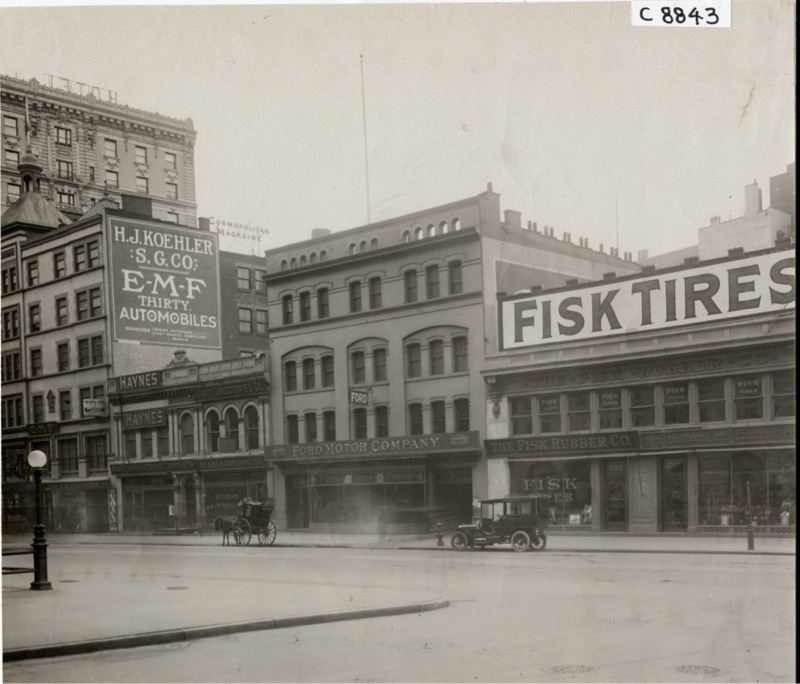 This photo is taken in front of the Ford New York Branch store. I'm not sure, but the radiator, long hood and rear fender lines look right for a Model K. The hubcaps look a little large, and the hood looks like it has louvre s. however I have seen photos of Model Ks with custom louvered hoods. If it is a K, my guess is a 1906 with more of a plow share style front fender? Who knows? 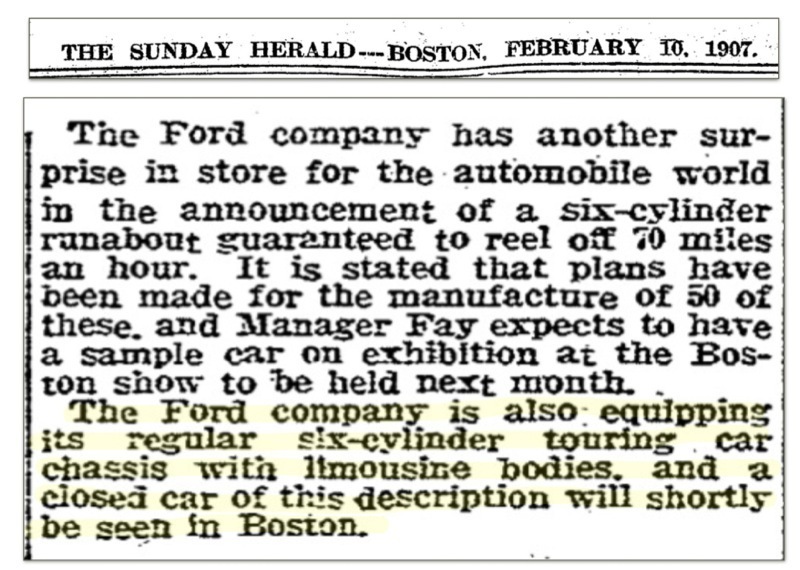 Also, did EMF begin producing cars before 1909? The sign to the left of the Ford store is advertising EMF. The photo is labeled 1908. Here is a clearer photo from the Detroit Library site. 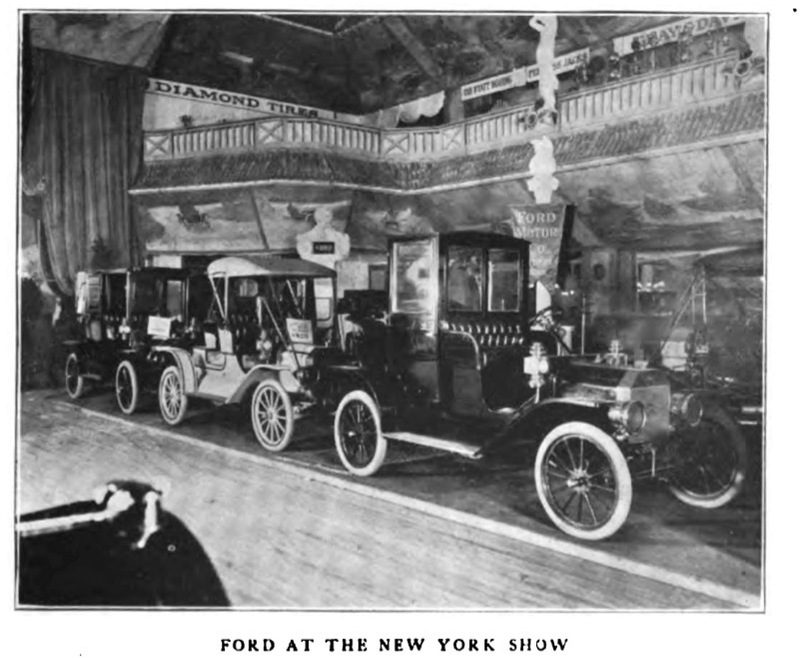 Great picture of the 1909 model year line up for Ford at the New Years New York show. Great photo David! Above is the link to show photo in my posting. Enjoy!!! The Detroit Public Library has contacted us to ask if we could send any corrections to them directly, they seem to be happy to have us scanning the photos. We would welcome such information directly so that we could modify the records. Please include the resource id number of the image(s) along the the corrected information. Thank you for your interest and consideration.